Puget Systems (www.pugetsystems.com), a boutique integrator of custom PC systems for enthusiasts, gamers, consumers and SMB markets, today announced availability of Intel's 2nd Generation Core processors (codenamed "Sandy Bridge") to its full line of PCs and workstations. Sandy Bridge incorporates improved video performance and memory bandwidth, and uses Intel's Turbo Boost Technology 2.0, providing even more performance when needed. For more information, a full Sandy Bridge technology primer is available from Puget Systems. "We are excited to use this new technology across our product line." said Jon Bach, president of Puget Systems. "Not only are we offering more performance for the dollar, but Sandy Bridge allows us to push our systems even more cool and quiet than before." • Echo: A power efficient, small form factor PC for full 1080p HD video playback. • Deluge: An extreme liquid cooled gaming computer. • Obsidian: A most stable, reliable desktop. • Serenity: A powerful personal computer optimized for quiet operation. • Spirit: A low cost, highly upgradable desktop. 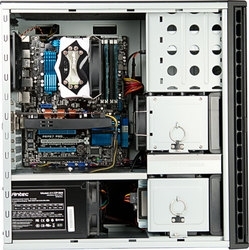 For more information, or to custom tailor a Sandy Bridge system, please visit (http://www.pugetsystems.com). Customers ordering online will have their new systems built and shipped within 5-7 business days.